One of the dilemmas you may face when buying a home in Hawaii is whether to choose a local real estate agent to represent you or to hire the listing agent. My story involved the best of both worlds. I did not really want to rely solely on a listing agent because I prefer my own representation, but on the other hand, not every Hawaii real estate agent knows every neighborhood on every island. I chose an agent who is licensed in Hawaii through the Honolulu Board of Realtors to help me buy a home in Hawaii in Big Island. She also was a resident of Big Island for a long time, involved in real estate and marketing new subdivisions. The drawback was, of course, she did not possess specific information about each neighborhood where my husband and I might want to buy our vacation home. On the other hand, listing agents typically need to accompany showings in parts of Hawaii, so I had the listing agent at my disposal to drill. I could ask directly the questions my agent might not know. How did you establish the price of this home? Even though my agent suppliedcomparable sales, they can vary widely in some areas based on upgrades and view. What kind of upgrades does the home have? Sellers are often known for trying to get back the full price of the upgrades, which almost never happens in reality because upgrades can depreciate. How have prices fluctuated over the years in this neighborhood? You can look at the tax records from a title company but they do not show the complete picture. But it is important to note whether prices are moving up or moving down. Have there been or do you expect any natural disasters? Big Island, for example, still has earthquakes, tsunamis, floods and volcanoes. No place in paradise is without a possible negative. Will the seller leave any furnishings? Let’s face it, you can’t haul a sofa on a plane with you to Hawaii. Many commodities in Hawaii are expensive. When you buy a home in Hawaii, you don’t expect to sleep on the floor. It is not uncommon to negotiate furnishings. If buying a home subject to an HOA, what are the restrictions regarding vacation rentals or pets, including what types of expenses are included in the HOA? 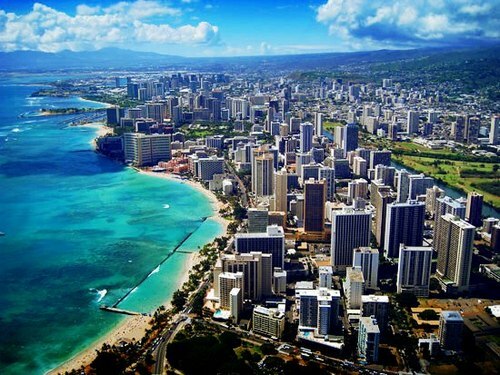 Manyhomeowner associations in Hawaii, for example, restrict rentals to a 30-day maximum. How many owners live in the area? This is especially important if buying a condo or townhouse because you might not be able to obtain financing if the ratio of investors to owner occupants is too high. How are the utilities handled and how do I apply as a non-resident? Many homes will have solar panels on the roof, but they might not provide electricity. Some solar panels are utilized only for heating water. Can you refer me to a handyman and maintenance people? When you’re absent for a good part of the year, lawns still need mowing and gardens cut back and watered. If you are handling all of the maintenance yourself, it’s good practice to line up your maintenance people before leaving the island. What sort of unexpected expenses might I need to know about? Property taxes in Hawaii are relatively low as compared to the mainland, but you will need a homeowner’s insurance policy, even if you pay cash for a home in Hawaii. There are other considerations. Who will fix a broken window, for example, if a flying pineapple hits it? In my own hunt to buy a home in Hawaii, I covered a lot of ground with my agent. It was just like being on House Hunters, and I would know because I have appeared on that show from the agent perspective of things, helping buyers in Sacramento buy a short sale. We first looked at a dome in Captain Cook on Big Island. It wasn’t an open space like you would expect, but instead featured a waterfall and pond in the center, so all of the rooms, even those on the second floor, were small and located on the perimeter, without that all-important view of the ocean, except from the balcony. Next, we toured a coffee farm in South Kona, high on the hill. We couldn’t drive up in our rental car, so the listing agent came down to get us. Near the top, the road was so rough and tough that her SUV could not move in first gear. We had to get out of the car to lighten the load and walk up an extremely steep rise. Oh, my aching calves. I could not see driving into town for groceries from there. We found a beautiful home in Kealakekua, situated halfway down a steep street. The living room was circular, about 500 square feet, providing a 180-degree panoramic view of the ocean. But to get to the master bedroom upstairs, you had to climb an exterior staircase, and both ensuite baths were very tiny. The rest of the home was nothing special, plus the listing agent said it requires tented fumigation at least once every 5 years. If we bought that home and I wanted to walk into town, I would probably need to crawl on all fours up the street to the main drag. On another day, we toured a home in Waikoloa, a subdivision of newer homes about 6 miles uphill from the ocean. Apart from the fact that off in the distance I could spot a haze over the ocean, I could have been in Elk Grove, California. The home was magnificently remodeled but the front yard was artificial grass. It was not listed in Big Island MLS as the sellers marketed this home only in Honoululu. Too many warning signs. I asked the listing agent if it was a flipper, and he acknowledged that fact. I am not a big fan of flipper homes. By now it was beginning to look like every entry-level home with a fabulous view had something dramatically wrong with it. I was willing to compromise on certain features but I was after that Hawaii lifestyle with a view at an affordable price, not so different than many other buyers for a home in Hawaii. If you don’t mind spending a million or more for a view home in Hawaii, you have many choices, not so many under that price point. As a last resort, I suggested looking at condos. I did not really want a condo. Many of them feel like apartment buildings, there is little privacy, and some don’t even have garages. Not to mention, a ton are basically investments and rented to tenants, which diminish resale value. You can look at the types of cars in the parking lot to get a feel for who lives in these complexes. Then by sheer luck we found the perfect home. It was classified as a condo but it was a single-family home. The HOA was responsible for the exterior and front yard. That meant it maintained the exterior siding of the home, the roof and the windows. The yard was filled with native Hawaiian plants on drip irrigation. Granted, it was only a cottage, 2 bedrooms, 2 baths and a den, not even 1,100 square feet; I fell in love. Also, the covered lanai offered an extension of space; it was like an additional family room. The home is perfect for my husband and me. And the view? Spectacular. Parachutes over the ocean. Cruise ships. Plus, it offered that great Kona breeze because the home was unobstructed unlike others in the neighborhood. It made me feel glad to be in Hawaii.